While this book presents the results of comprehensive and cooperative international reseirch, this effort would not have been successful without the assistance of various institutions and personalities. Financial support for the conference was received from the Volkswagen Foundation, Germany, and the Deutsche Forschungsgemeinschaft (DFG) which is gratefully acknowledged. The Deutsche Ralffeisenverband kindly contributed to hosting the international group of researchers in Bonn. For their valuable comments we also thank: Uwe Eiteljorge, Johannes Jutting, Amim Kuhn, Witold-Roger Poganietz, Matin Qaim, Alexandra Schleier, Ludwig Striewe, Jllrgen Wandel, Peter Weingarten, Manfred Wiebelt and Susanna Wolf. The editors also acknowledge the help provided by James Creed, Karin Clark, and Ulla Knodt in checking language and style of the articles, most of them written by non-native speakers. Martin Grub, Tina Klebsch, and Andrea Stang have been helpful in providing technical assistance needed to prepare the manuscript. 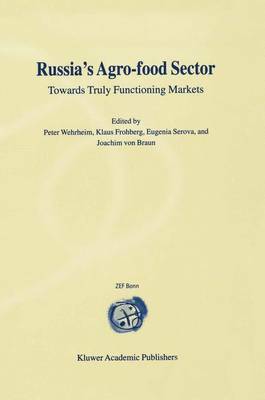 Bonn Peter Wehrheim Eugenia V. Serova Moscow Halle/Saale Klaus Frohberg Bonn Joachim von Braun January 2000 x Russia's Agro-food Sector: Towards Truly Functioning Markets Wehrheim, P., E. V. Serova, K. Frohberg, and J. von Braun (eds.) Kluwer Academic Publishers, pp. 1 - 8 SECTION 1 Introduction and Overview Peter Wehrheim, Eugenia V. Serova, Klaus Frohberg, and Joachim von Braun 1. INTRODUCTION This publication takes a close look at the agro-food economy in Russia.